Author John Berendt fell in love with the city of Savannah, GA on his first visit. After taking up a part-time residence in the city, Berendt began writing a work of nonfiction that reads like a wild soap opera. 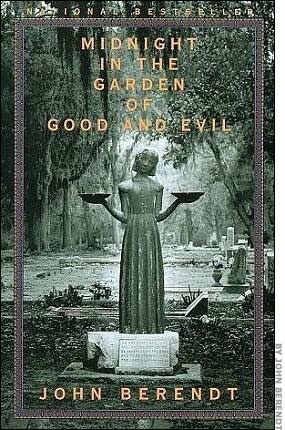 Midnight in the Garden of Good and Evil tells the story of Jim Williams and the murder of his young lover, Danny Hansford. Berendt intertwines Williams's story with the lives of other colorful Savannah residents and the city itself becomes a minor character in the story. Set in the shade of live oaks and spanish moss, the story that Savannah residents like to simply refer to as "the book" is a twisted tale that seems to go nowhere and everywhere all at the same time. Midnight in the Garden of Good and Evil can be dark one minute and hilarious the next. Berendt takes the reader for a fun-filled mystery ride. It is very easy to forget that this book is considered nonfiction since it reads like a love song to the southern city of Savannah. The book actually inspired me to take a road trip to Savannah and I was pleased to find that it was literally like stepping into the story. The Mercer House stands facing some of the most gorgeous squares and Bonaventure Cemetary is every bit as eerily beautiful as Berendt promises. This book is a must read for anyone that has been to Savannah or anyone planning to go there. Even if you're not, read it anyway, it's just a fun book. When you're done, go ahead and see the movie starring John Cusak. This is very difficult for me to say, but believe it or not it actually is one movie that lives up to the book.